Pursuing their explorations of international Funk and Disco music, Favorite Recordings and Patchworks present us Voilaaa. 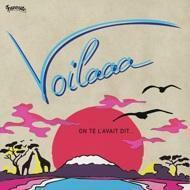 Following a first 2 tracks single acclaimed this summer and clearly revealing the Afro-Disco inspiration of this new experience, here comes Voilaaa’s first album, titled On te l’avait dit. After his projects such as The Dynamics, Mr President, Mr Day, Patchworks Galactic Project, or Taggy Matcher, the insatiable French producer therefore returns to his first love and specialty, Disco music, staring this time at the African and Caribbean influences. The 10 tracks of the album are instantly up to expectations, chaining hit after hit tirelessly, and offering brilliant collaborations with Sir Jean, Pat Kalla, Renaud Bilombo, or label mates Hawa and Fouley Badiaga.